The issue of homelessness is being highlighted this week in all Simon Communities right across the country in the 5th annual “Simon Week”. The week runs from the 1st to the 7th October and a wide variety of events are underway across the country. The Midlands Simon Community has a very full programme of activities planned and there will be lots of opportunities for people to find out more about the work of Midlands Simon, and also many ways for people to show their support for those experiencing, or at risk of homelessness in our community. Midlands Simon helps people to move out of homelessness. 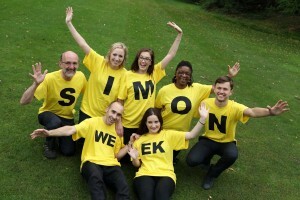 “Simon Week” is also an opportunity to highlight the fact that there are a range of difficulties that can cause people to experience homelessness and to require the support of Midlands Simon Community. The main challenges and difficulties Midlands Simon help people to overcome are; Poverty and the cycle of disadvantage, severe financial difficulties, lack of opportunities, long term health and mental health difficulties, those affected by domestic violence or abuse, relationship breakdown. To date Midlands Simon has now provided support to over 950 people right across the Midlands. The focus of the week will be asking everyone to “Take a Step for Simon”. That step can be anything as big or small as people choose, such as hosting 2 or arranging a fundraising event, take part in an activity for Simon, help highlight the issue of homelessness. 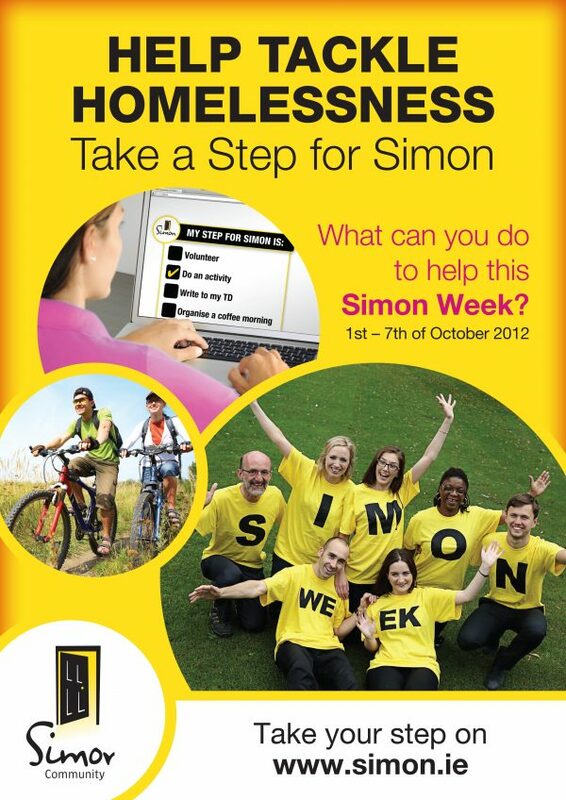 There are many ways people can help, the first “step” is to log onto www.simon.ie . Mr Tony O`Riordan, CEO, Midlands Simon said “Midlands Simon is dependent on the support of the public and volunteers in all areas of our work. We could not survive without all those who help us in so many ways to provide the ongoing care and support to all our Service Users, and to all those who help us to raise the funds we so desperately need. We are also highlighting that Simon supports people every step of the way back to independent living, we believe in people and believe that everyone can make a difference. We are asking people to take a “step” with us this week and show their support for those experiencing homelessness in our community”. An Inter-Agency briefing will take place on Wednesday 3rd, providing information to Service Providers on the work of Midlands Simon Community. On Thursday 4th, an Oireachtas briefing is taking place in Leinster House, which will be attended by all TDs and Senators from Laois, Longford, Offaly and Westmeath. There are also a number of events taking place across the country throughout the week with many ways for people to show their support. So Simon Week is underway. We believe that everyone can make a difference and that there are many “steps” that you can take to help out; Be aware that people who are homeless are essentially the same as everyone else and that it can happen to anyone and believe that nobody chooses to be homeless. Believe that with help and support people can overcome challenges, even homelessness. Believe that Midlands Simon is making a difference. 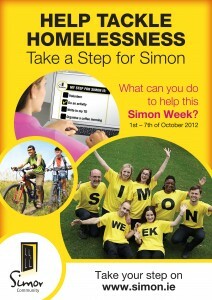 Believe in people and “Take a Step for Simon”, just log onto www.simon.ie .